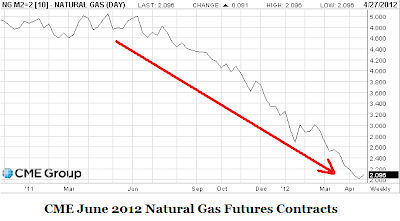 For almost the last year, greedy, destabilizing, market-manipulating speculators in the futures markets have been driving up down the price of natural gas to historically high low levels, see chart above of prices for June 2012 natural gas futures contracts on the CME, which have fallen from about $5 per million BTUs to $2 over the last year. Despite claims to the contrary, commodity prices in both the spot market and futures market are ultimately determined by the twin market forces of supply and demand, and cannot easily be manipulated to deviate from the overwhelming, natural and powerful forces of market fundamentals. 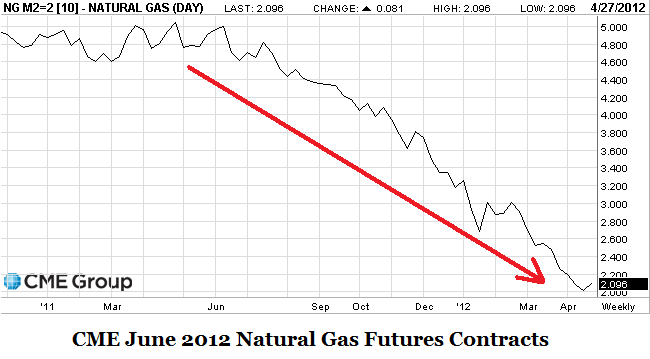 When natural gas prices are falling, it's a sure bet that increases in supply and/or decreases in demand, e.g. due to mild weather, are responsible. When oil prices are rising, it's a sure bet that decreases or potential disruptions in supply and/or rising demand are responsible. If speculators bet against market forces and the direction of prices resulting from those forces, it's likely they'll get punished with losses. On the other hand, if they correctly predict the pending effects of market forces on future price changes in oil or gas ahead of other traders, they could be rewarded with gains; but it's because they're betting on the market, not against market forces. It's also a sure bet that we'd have high spot oil prices and low spot natural gas prices right now due to market forces, regardless of whether the CME offered futures contracts on those commodities. That natural forces in the natural gas market may be overwhelming speculators, does not mean that speculators cannot get a stranglehold on other futures markets. The St. Louis Fed says speculators jacked up oil prices 15 percent in the 2008 run-up. "However, speculation significantly contributed to the oil price increase between 2004 and 2008. Our analysis pins down the start of speculative forces driving oil prices in 2004, which is when significant investment started to flow into commodity markets. We find that the decline in the real price of oil in late 2008 is driven mainly by the negative global demand shock associated with the recession after the Önancial crisis. However, we note that the speculative shock also played a significant role in the decline as the financial crisis eroded the balance sheets of many Önancial institutions, which in turn a§ected their demand for commodity assets in their portfolio, consequently pushing prices down." Crickey, this is the conservative right-wing St Louis Fed speaking--and saying that speculators exacerbated a swing in oil prices that helped usher in a honking recession. I think the St. Louis Fed is being a bit naive, and the picture is worse. After all, are we to suppose OPEC-Russia are standing on the sidelines? I see no reason to not raise margin requirement, and make transparency paramount in commodities futures markets. Sunlight is a powerful disinfectant. Do you see any reason not to have minimum tax or knowledge requirements for voting? What about making voting transparent so everyone knows who everyone else voted for? If not, why is transparency and minimum requirements necessary for private markets, but not political markets? After all, sunlight is a powerful disinfectant. You, also, are putting on your bias display. You want to blame speculators for oil price run up in 2008, but just can't bring yourself to credit/blame speculators for oil price run downs. Perhaps you'd like to make the argument that oil prices are too low or cite some economist somewhere saying that speculators are responsible for prices being too low. No? I cite the St Louis Fed, and they say speculation exacerbated swings--so yes, I am saying there are times when speculators force markets too far down. I think voting should be by secret ballot. Too much opportunity for corruption and recrimination. In financial markets, transparency is best, and I am hardly alone in that sentiment. I guess on this score, we disagree, but your commentary is made in such an agreeable manner, I will contemplate your words. Perhaps you misunderstand me. No, we do not post online all the stock buys of Mrs, Jones, 50 shares of IBM etc. We require that the true buyers of futures positions be revealed when necessary, to the CFTC. No cloaking of identities. Since there are thousands of trades a day, I doubt newspaper or websites will be putting online the trades of Mrs. Jones. Very large trades by known players might get posted. Why treat very rich people differently from moderately rich people (All Americans are rich. To be in the global 1%, all you have to make is $34K/year, which is below the US median). I think I do understand you - you want to treat people differently based on how much they can buy. You claim that secret ballots are necessary to reduce corruption and recrimination, but insist on disclosure in markets, so you can recriminate the people making purchases or sales of which you don't approve. Making recriminations based on this will lead to corruption. If you don't like the way a company/person/whatever does business don't do business with them. Don't impose costs on them and the people who do want to do business through the political process simply because you don't like them. This smacks of political patronage, which as I mentioned above leads to boat loads of corruption. "We require that the true buyers of futures positions be revealed when necessary, to the CFTC." This is one of the stupidest comments I've read here all week. Congratulations. What, exactly is a "true buyer"? Does a non true buyer cross his fingers behind his back as he or she hits the enter key, or just whisper "I'm just kidding"? Just how is it done? Who can determine, and how can they determine, that a true buyers positions must be revealed to the CFTC ? I can hardly wait to hear this explanation. What Can Onions Teach Us About Oil Speculators?